Found inside dead flower stalk of yucca-family plant called Sotol on lower slopes of Organ Mountains. The stalk showed evidence of woodpecker activity, so I split it open to see what might have attracted the woodpecker(s). There were 20 or 30 good-sized larvae living inside it. I saved the bottom 20 inches or so of the stalk intact to see what might emerge after any larvae inside it pupated. These larvae seem intermediate in form between Buprestidae and Cerambycidae. We have something in Arizona called the sotol borer, and I suspect that is what you have. If so, they will hatch into some really spectacular and rarely-seen buprestids! 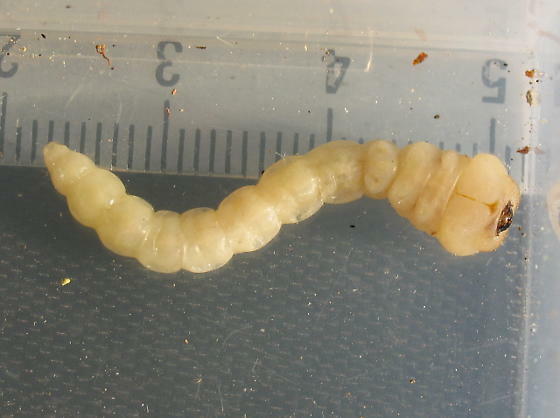 but I have seen cerambycid larvae that are enlarged in the head area, so it could be one that is extremely so. Although the plant was not Agave deserti, I'm wondering if this might be the Agave Longhorned Beetle. Many botanists put the yuccas and agaves together in a separate family, theAgavaceae- so agave beetles on yuccas isn't that far-fetched. However, the narrow leaves and toothed leaf margins make me think your plant isDasyrlion- better known as Sotol. That means "sotol borers" are much more likely. I just looked at Web images of Sotol, and that's definitely the host plant. Here's a Web site that discusses the differences between sotol/yucca/agave.